The larger and bulkier the loads that have to be moved, the higher are the demands on forklift truck drivers. If the view in the direction of travel is obstructed, then they have to drive in reverse. This leads to the adoption of a posture that is neither healthy nor conducive to productive work. Linde Material Handling (MH) has now added an ergonomic solution to its range of products: The industrial truck manufacturer offers an optional elevating cabin, designed for heavy forklift trucks in the load capacity range from ten to 18 tonnes. At the push of a button, this cabin can be raised steplessly to a maximum height of 5.5 meters in less than ten seconds. In this high position the driver has an unobstructed view of the load and can drive forwards as usual. The elevating cabin is especially beneficial when it comes to the stacking as well as the storage and retrieval of heavy goods, or when placing them into small loading docks, such as aircraft side loading doors. The German accident prevention instructions (BGV D27) for industrial trucks stipulate that “the driver should reverse if, by way of exception, a front forklift truck is used to take and move a large load that blocks the view of the drive lane. Thanks to the rotating driver’s workstation for IC and electric trucks from Linde Material Handling, drivers no longer need to twist because the entire workstation rotates. This feature improves the view of the load and direction of travel significantly. In addition, the musculoskeletal system of the driver is relieved and symptoms of fatigue and health risks are reduced. With the new elevating cabin, drivers can avoid reversing if the view in the direction of travel is obstructed and will not be tempted to illicitly move forks and load above eye level in order to see their way underneath it and drive forwards. The elevating cabin means they can work more ergonomically and efficiently, as driving forwards is much safer and faster, particularly over longer distances. Moreover, the risk of collision damage caused by loads protruding laterally beyond the truck is minimized. The elevating cabin can be operated via a separate joystick or via four preset position buttons that can be individually programmed to a specific height. The cabin elevates at 0.24 m/s and can thus reach its maximum height of 5.5 metres in less than ten seconds. This position is ideal for allowing a full range of vision even when transporting long, bulky and heavy goods. Automatic speed limiting, corresponding to the cabin height, ensures safe operation. The maximum speed of travel can also be reduced via the default settings. Linde heavy trucks are also available with a rotating cabin as an alternative to the elevating cabin. Here the driver can rotate the entire cabin by 180 degrees, so that the load is behind him and he therefore has an unobstructed view of the drive direction. In addition he can select any intermediate angles and view areas. 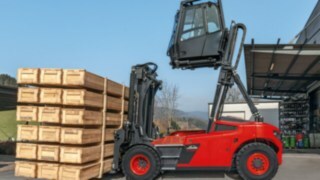 The new elevating cabin is optionally available for heavy forklift trucks from Linde Material Handling (MH) with a load capacity from ten to 18 tonnes. It can be raised to a maximum height of 5.5 metres in less than ten seconds. In this elevated seating position, the driver has a full view of the load and can drive forwards as usual. The elevating cabin is ideal especially when it comes to the stacking as well as to the storage and retrieval of heavy goods, or when placing them into small loading docks, such as aircraft side loading doors. 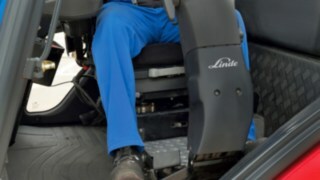 These rotatable driver workplaces have been developed for Linde electric forklifts in the load capacity range of 2.5 to 5 tonnes and combustion-engine Linde trucks in the load range from 2 to 8 tonnes. Depending on the model and design, the driver’s seat including steering column and pedals can be continuously rotated by up to 90 degrees to the side so that the driver is positioned sideways to the direction of travel. According to surveys by the German Employers’ Liability Insurance Association of Trade and Logistics (BGHW), this feature improves driver ergonomics by around 60 percent. 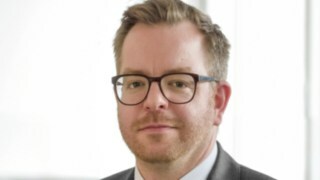 At the same time, reversing is much safer and health protection and health care of the logistics staff are improved, so that ultimately a company’s operations are more sustainable.